Yesterday I had a trip to Potfest, I had a great time, saw some amazing work and met a few potters whose work I have bought over the years so that was nice. I was able to buy a few supplies including glaze for my dinner set. One of the most amazing things I saw was a 3 D printer making pots. I have some of Joan Hardie’s work already; I was amazed to see her work going in a totally different direction these days. It was a fascinating process to watch, and Joan’s ceramic pieces were exquisite, like intricate, translucent, almost eggshell like forms in the most beautiful and intriguing shapes. If you would like to see Joan and Jack’s work they have a website which explains how their pots are printed. After the raku firing I had last week, when all my pots cracked, it was my good fortune to watch a raku demonstration, and the chap ( I forget his name) gave me some great advice as to why my pots may have cracked, I think I knew where I had gone wrong already but he confirmed this, and gave me some tips too. These are my cracked pots, although disappointed I’m not too bothered as I’m just getting the hang of firing with the gas torch, you need to get a feel for it, and I did get some fantastic colours on these pots. What you can’t see is how the colours sparkle and shimmer in the light. So what do I do with my cracked pots? It seems such a shame to throw them out. I had another minor disaster last week when I broke a piece off one of my greenware pots, but after a bit of filing, and drilling a couple of holes I have turned it into one of my favourite bowls to date. A lovely noodle bowl, I need to make some more of these now. I love this glaze and so I bought a large tub of it from Sedgefield Pottery when I was at Potfest, I think it could be the one for my dinner set, but I may do some test fires on mixing glazes before I decide. I feel I have learned so much this week, I know there is a long journey ahead of me, but that’s the fun of it, and why I’m going down this path. Happy days ! This entry was posted in kiln fired art and tagged cracked pots, noodle bowl, potfest, raku. Bookmark the permalink. Your noodle bowl would also make a great yarn bowl! Question, I always thought Raku vessels were not food safe, even though Most of the glazes are Non toxic, ( I know some have soluable copper that leaches ) something with the firing makes them not usable for food. 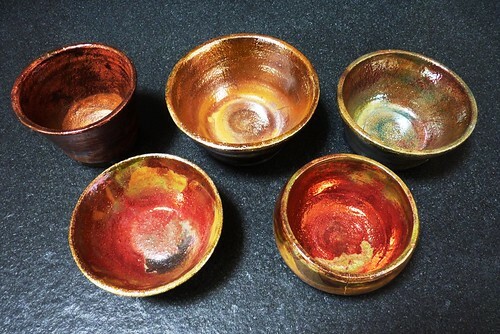 Just curious , You got some great color on those cracked bowls. Yes you are right, raku is not food safe, the pots are porous and probably wouldn’t hold water. 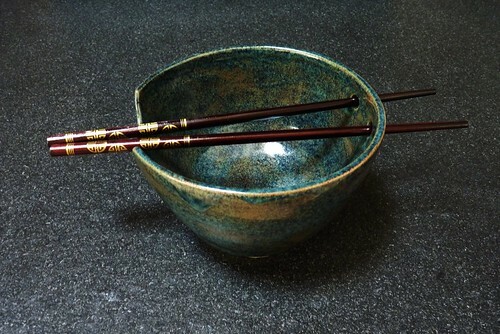 Mine are purely decorative.The noodle bowl is stoneware and it has a food safe glaze.